The last article was about details of foreign funding to Shabnam Hashmi’s NGO ANHAD. In that article we mentioned that one of the founders of ANHAD was Mr. Harsh Mander, a former IAS officer and Action Aid India man. According to Wikipedia page, Harsh Mander was a signatory to the campaign to save Afzal Guru, a terrorist convicted and later hanged for the 2001 Indian Parliament attack. Mander also supports the demand for removal of the Armed Forces (Special Powers) Act, 1958 from Kashmir and North-eastern states. Harsh is convener of the drafting committee for the Communal Violence (Prevention) bill. Harsh Mander applied for mercy to Pakistani terrorist Ajmal Kasab courting a huge controversy. Wikipedia page further tells that Harsh became member of National Advisory Council of the UPA government in 2010 and special commissioner to the Supreme Court.He was removed from the NAC in 2012. He worked formerly in the Indian Administrative Service in the predominantly tribal states Madhya Pradesh and Chhatisgarh for almost two decades. Harsh Mander heads NGO called “Aman Biradari”. He is founder member of Shabnam Hashmi led organization ANHAD. But this article is about Mr. Mander’s another organization – ‘Centre for Equity Studies’(CES). This is a foreign funded (with partial funding from Christian organizations and church) NGO, headquartered in Delhi. We have obtained two-year data of foreign funding to Mander’s Centre for Equity Studies(CES). In year 2011-12, CES received Rs 7,55,17,631.25 foreign funding. As per CES’s submission before government’s concerned department, justice for victim in states including Gujarat was one of the cause for which foreign fund was received and utilized. Research and homes for street children were other works for which money was received and spent in Gujarat area. As Gujarat is involved somewhere, we are covering Harsh’s Delhi headquartered CES in our series. In 2011, Mr. Mander’s NGO received highest amount of aid from Netherlands based ‘Partnership Foundation’ for “welfare of children”. From online resources we learn that Partnership Foundation was set up by Ferd van Koolwijk, a Dutch businessman, who initiated the Rainbow Home Program in February 2002 for school children at Sister Cyril’s Loreto Day School in Kolkata. Sister Cyril is from Ireland based Christian religious organization – Institute of the Blessed Virgin Mary (Loreto). Harsh Mander is the main partner of Partnership Foundation in New Delhi. Rainbow Home program is for homeless girls upto age of 18. 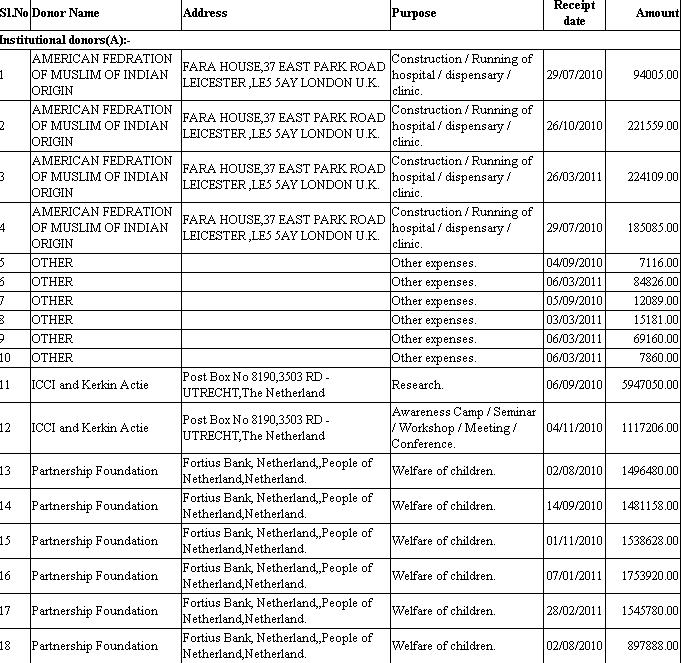 Partnership Foundation has donated crores and crores of rupees to Mr. Mander’s NGO apparently to run Rainbow homes. Then CES has received nearly Rs 90 lakh are as donation from Denmark based Christian organization DAN Church AID. Rs 10 lakh received from America based Association for India’s Development(AID). This organization called AID also supports Medha Patkar in her Narmada movement and anti-Delhi Mumbai corridor movement. AID supported the movement to free Binayak Sen who was allegedly connected to Naxals and therefore jailed, but released later. Arvind Kejriwal is AID Saathi. What is AID Saathi? Well, AID recognizes certain activists in India with “Saathi” awards and support them in a manner that allows them freedom to operate without the constraints of a specific time-bound project. The program creates a mutually enriching relationship between AID and the Saathi and entails not only support in the form of a stipend, but also non-monetary involvement and strategic support from AID volunteers. Germany’s BODO Huetten Foundation which works with children in education sector is another donor. Action Aid India is ofcourse at Mr. Mander’s help. International Development Research Centre – another donor to CES is headquartered in Canada. Members of IDRC’s Board of Governors are appointed by the Government of Canada. One interesting source of donation is the Hong Kong and Shanghai Banking Corporation Limited (HSBC) – the bank that was in news for alleged dubious money transfers. America based Indian Muslim Relief & Charities is another donor of Mander’s NGO. The same Muslim organization helped Shabnam Hashmi’s ANHAD also. Now let’s move on to year 2010-11 records. Mr. Mander’s NGO CES received foreign funding of Rs 47817508.11 in this year. Partnership Foundation is of course the top donor. IDRC also there. Then there’s an organization called Sangat which is based in Bradford, UK. American Federation of Muslims of Indian Origin is another donor of CES this year with less than Rs 10 lakh donation. Then there’s again a Church. One NGO ‘ICCI and Kerkin Actie’ has donated around Rs 70 lakh in a year to Mr. Mander’s NGO for research, seminars and other activities. Kerkin Actie (in Dutch) means Church in Action. 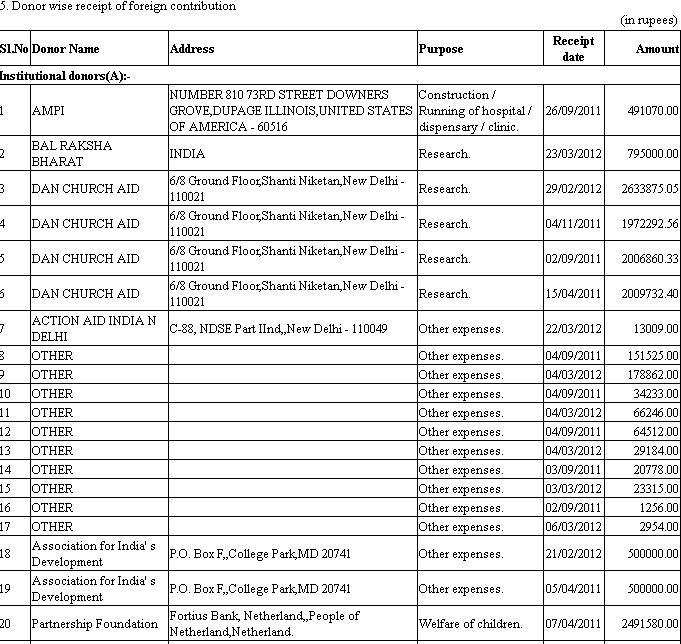 Concluding – in two years Mr. Harsh Mander’s one NGO CES received Rs 123335139.36 fund from abroad. We don’t have any detail about locally sourced funds of CES. When I read status updates on left-winger NGO operator Shabnam Hashmi’s foreign tours, when I look at her anti-Modi ad anti-Right campaigns on Facebook, when I learn that she travels in planes, and manage to have a house in Amdavad, when I learn she camped in Gujarat before the assembly elections for weeks and weeks, the questions arise in my mind: how one manage to spend so much without doing job or business like normal people! But after getting hold of the official documents on foreign funded organizations in India, I have been able to find some answers. Shabnam Hashmi runs ANHAD (Act Now for Harmony and Democracy) with registered address as 23, Canning Lane (Pandir Ravi Shankar Shukl Lane) in New Delhi. Her association is described as Cultural, education and social. Yes, the word ‘political’ is not part of the description. Now let’s do dissection of the foreign fund, Shabnam Hashmi received during that year. The highest foreign fund was donated by Britain based organization Christian Aid. ANHAD has received around Rs one crore fund in a year from this organization. Among the other organizations that made donations to Ms. Hashmi’s ANHAD are IMRC (Indian Muslim Relief and Charities) headquartered in Palo Alto California and Church Auxiliary for Social Action(CASA). Now let’s move on to the figures of year 2010-11. ANHAD received foreign donation of Rs 1,65,25,433. 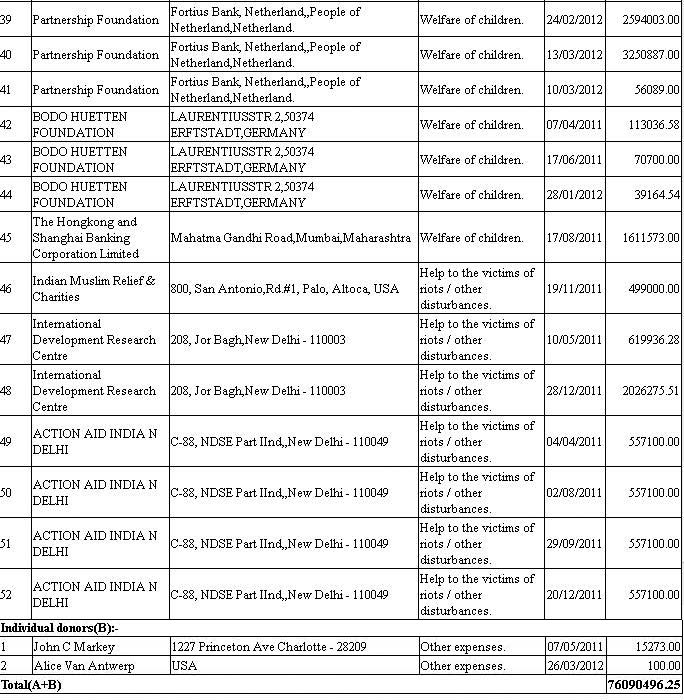 Christian Aid was again the main donor Google India,with donation in this year worth Rs 84 lakh around. In both 2011 and 2010 OXFAM was also one of the major donors of ANHAD. ANHAD was established in March 2003, as a response to 2002 Gujarat riots by Shabnam Hashmi, Marxian historian Prof. K N Panikkar and social activist Harsh Mander. As per its Wiki page, ANHAD plays a major role in Gujarat to fight against human right violations,as well as in the Kashmir Valley.ANHAD is registered as a trust and has six trustees. They are Shabnam Hashmi, K N Panikkar, Harsh Mander, Shubha Mudgal, Kamla Bhasin, Saeed Akhtar Mirza.